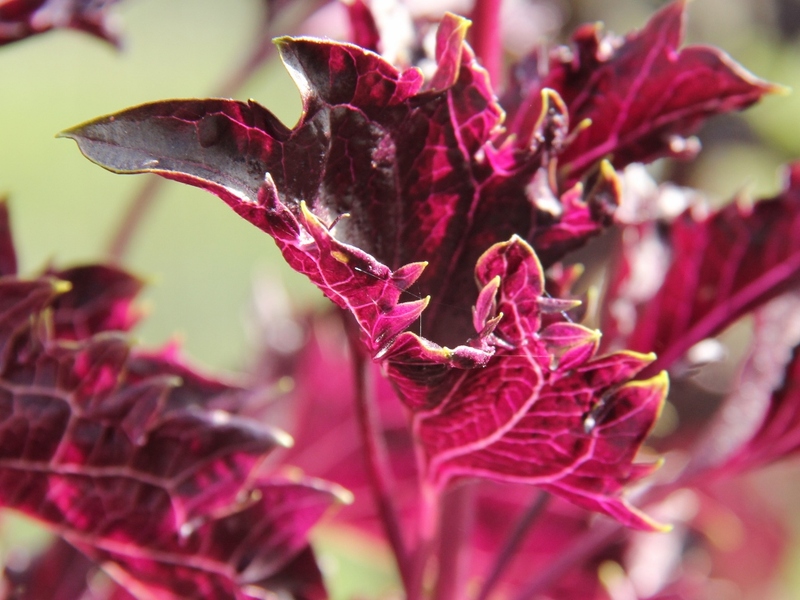 With its sharply serrated leaves that are an ominous shade of very dark blood red, purple basil is a plant that exudes gothic drama. Its sombre and gloomy looks are in contrast with its delightful anise-seed scent and unexpectedly pretty lilac coloured flowers. For such a dramatic looking herb, it is perhaps fitting that, when used for dyeing, it gives moody, unstable and entirely unexpected colours. The colour of the dye bath – a suitably gothic shade of purple black – may get you excited but the eventual colour you get is completely different. And the dye reacts to pH, so it gives you plenty of opportunities for playing around with colour modifications, but even this process can lead to some frustrating surprises. 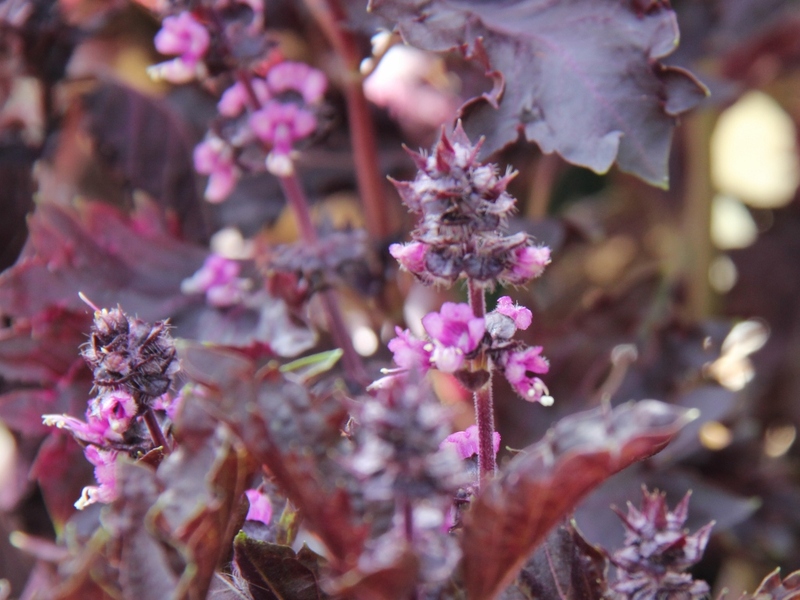 Growing purple basil is very easy, the only complication for those of us living in colder climates is that it is a tender plant, needing somewhere warm to grow until the frosts are over. I propagated mine in a heated propagator in an unheated greenhouse, but a warm window sill would be perfectly adequate. The seeds germinated well and I got plenty of plants which were growing fast. Although I had intended to transplant them into a flower bed in June, this year it was very chilly even at that point so I ended up leaving them in the greenhouse, where they grew perfectly happily in one litre pots. Purple basil is of course edible too. It has a distinct anise seed taste, so it is closer to Thai basil than the usual green variety, although I have seen a recipe for a purple basil pesto which I definitely want to try to make one day. I picked my first harvest in the middle of July, and by now – early September- the plants are pretty large again, ready for a second harvest. I placed the stems and leaves in a pot, poured boiling water over them and simmered for about an hour. The dye bath was a wonderfully dark purple, and I was getting very excited anticipating the colours I imagined I would get. A few days later I put some alum mordanted wool and silk in the pot, and simmered them for about an hour. Watching the fibres in the pot, I quickly realised, with slight disappointment, that they looked very dark grey, not purple at all. The biggest surprise, however, came as I lifted the fibres up – the dark colour was just an illusion: as the dye liquid drained away from the fibres, my wool top was very very insipid light grey colour, it was as if the dye was not sticking to the wool at all. Having said that, my silk skeins absorbed the colour very well and were by now very dark steely grey. In fact, I had been warned about the fact that the dye does not stick to wool very easily, so I just left the fibres in the pot in the sun for a week or so, might even have been two, before proceeding with the modifications. I had also put some of the dye liquid and wool in a solar dyeing jar for the same amount of time, and this seemed to work just as well as the pot that had been simmered, so with this dye it is definitely time that is the important factor, not high heat. After a few weeks of solar dyeing, my wool skeins and top were light-ish stormy grey, with a hint of blue if you looked very closely. I then did my usual colour modifications with acid, alkali and iron. The acid made wool very slightly greyer but with silk came the most pleasant surprise of all – I got a wonderfully plummy purple colour. 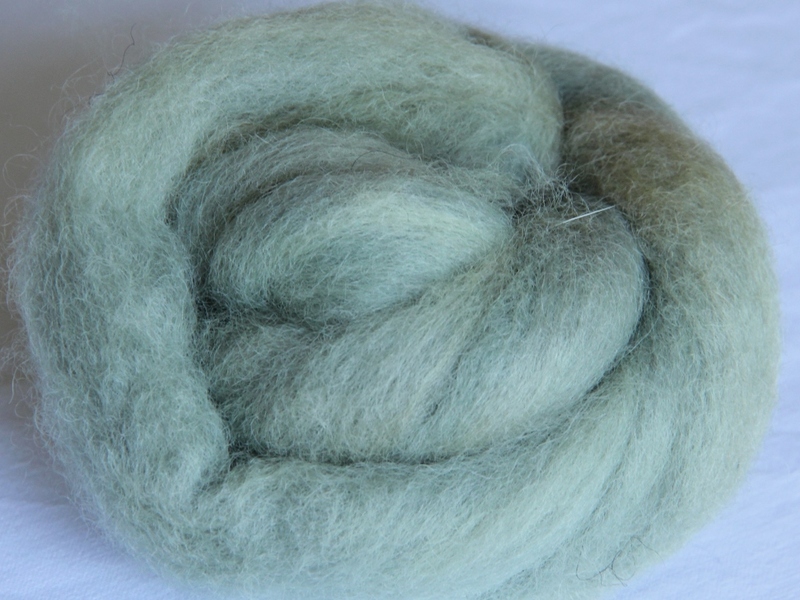 Alkaline after-bath turned both fibres greener, the wool in particular became a nice light soft green. Iron on the other hand just made wool even murkier and gloomier, so it wasn’t really worth the effort. With silk iron darkened the grey in a nicer way, so that may well be an effect that one might want to achieve. I didn’t rinse my fibres at this point, as I had read it’s better to leave them to dry unrinsed, and then rinse and wash them a few weeks later. I had also dyed some copper-mordanted felt samples, but these became very dull grey, more or less the colour your paint brush rinsing water ends up after a water colour painting session, so it is not really worth bothering with. Perhaps because this was the first dyeing session of the year, I didn’t label my samples, I really do not know what I was thinking (if anything…). I think it must have been that at the time I thought I’ll be able to tell the difference (usually a big mistake). 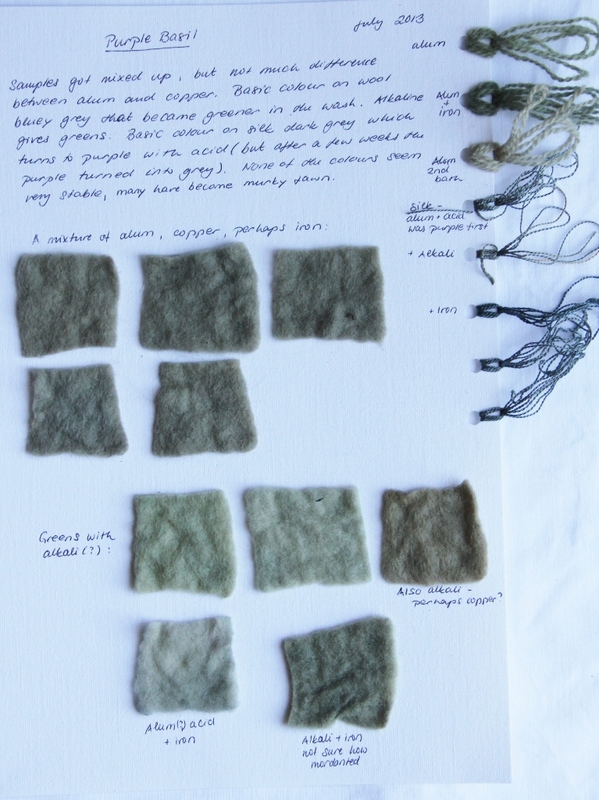 Well, after about two weeks, when I got back to my dried samples, the colour differences were not nearly as prominent as they had been straight after dyeing, my little felt sample squares had all become the same slightly murky grey, really could not tell them apart. And the colours on the other sample fibres did not prove to be very stable either: the lovely purple silk skein was no longer purple, it had become a mottled mixture of grey and fawn. The bluey-grey wool top was no longer very blue, that too had become a slightly murkier grey colour. 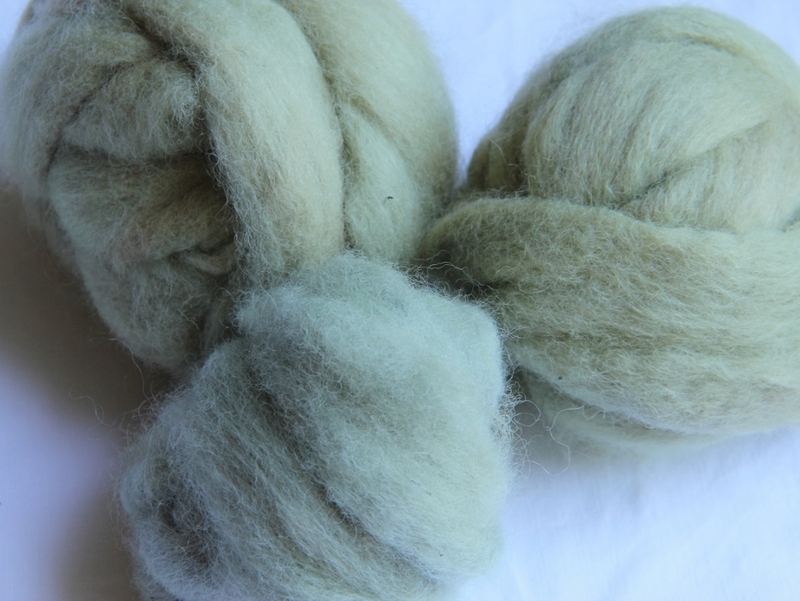 Only the wool that had received the alkaline treatment was still noticeably light green. All my sample colours, regardless of the treatment they had had, somehow ended up the same shade of very gloomy and dull grey. And no amount of playing with the white balance setting on my camera made it possible to reproduce those colours accurately. Unlike wool, silk absorbs purple basil dye easily, giving you some very nice steely blue-greys. The purple colour from the acid treatment proved unstable, it is the skein right at the bottom which became a slightly mottled mixture of grey and fawn. Finnsheep top dyed with purple basil. 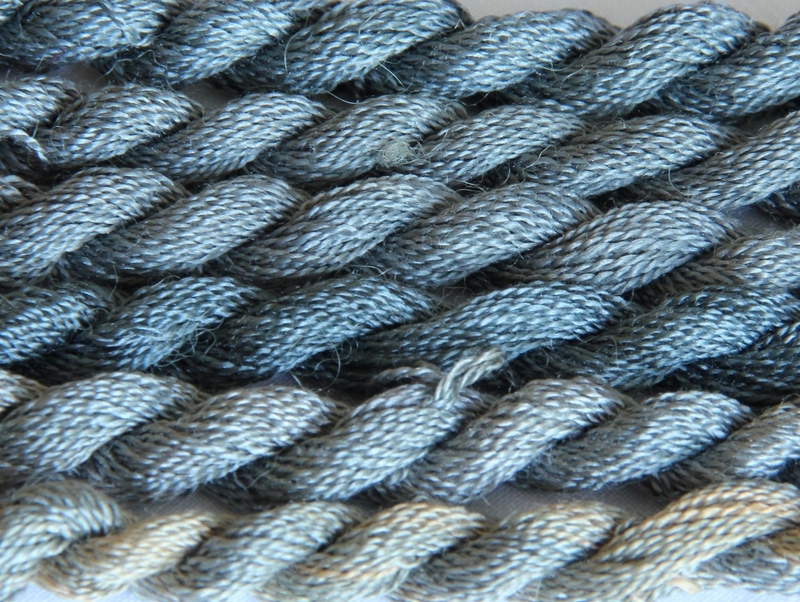 The wool in front – a pale bluey grey – is the unmodified colour on alum mordanted wool. In a wash this lost some of its blueness, and became a bit more green. The two at the back are the more greener versions from an alkaline bath. The final surprise came as I washed the samples. The grey top, the one that had started blue-grey, became greener, obviously reacting to the pH of the washing detergent. I know dyers are meant to wash their fibres in a “pH neutral detergent”, but I have not yet come across a detergent that is so pH neutral that my natural dye samples wouldn’t react to it (even Synthrapol, the specialist textile detergent dyers use, in my experience shifts dye colours slightly towards the alkaline direction). To balance the alkaline pH of soapy water, it is often recommended that you should add some vinegar to the final rinse of wool. I rarely bother with this, but in the case of purple basil it might be necessary if you want to stop the colour turning green. Having said that, the colours on the whole do not seem very stable and the nice shades I got with acidic baths seemed to disappear by themselves over time. My yarn skeins ended up various shades of green. The one in the front is alum, the darker one at the back has been modified with iron and the lightest yarn is from a second/exhaust bath. So, all in all, if you want an interesting dyeing session, try purple basil. 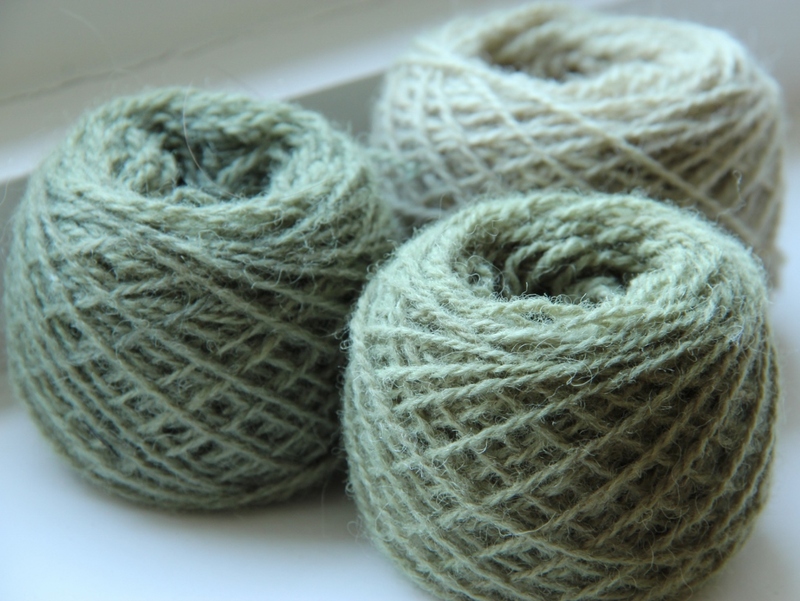 With wool you will not get dark colours you might initially expect from the colour of the dye bath, but if you, like me, are fond of pale mossy greens and light versions of stormy grey shades, it is definitely worth having a go. Categories: Colour Files, Dyeing, Green, Grey, Growing Dye Plants | Tags: dyeing blue-greys and greens, natural dyeing with purple basil, plant dyes | Permalink.